I was browsing my local supermarket one day when I realized that they now have an "international food" isle. Actually, this isle was probably there since the store opened in 2005 and I never bothered to check it out before. Most of the stuff in the isle is stuff found in other isles only arranged in categories like Jewish foods like matzo and matzo ball mix, Asian food, including imported ramen and instant rice mixes, dried noodles, various Asian sauces, and then I had this huge spit take when I realized there was a "British food" section. I find it odd that an American supermarket would have a "British food" section seeing as a lot of "American" foods like Apple Pie (which I have dubbed a proper noun for some reason) were ripped off from Britain to begin with. According to my local supermarket, British people eat oatmeal, lemon jam, and Mars Bars. Why the hell are Mars Bars nearly impossible to find here? You would think that Mars Bars would be Mars' flagship candy aside form M&Ms, but for some reason these candy bars are only sold everywhere else but the US it seems. I still haven't tried a Mars bar for myself actually, because the imported Mars Bars are three dollars each and for that price I could get perhaps six Milky Way or Snickers bars at the checkout. Excuse that, I mean THREE Snickers or Milky Ways, not six. I was reckoning in 2001 dollars there for a moment. For some reason even odder than the lack of US Mars Bars, Heinz Beans are kind of a specialty food in the US, it's one of this things I never realized we didn't have until I saw them here in the International section. 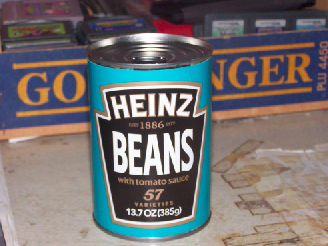 Heinz dosen't meanz beanz in the US. In America Heinz meanz ketchup and relish and very little else. Perhaps pickles. I don't know. Anyway, this was the first time I saw a can of Heinz Beans on a shelf, and of course when I point them out to Mom and she says "Oh! Perfect! Now you can make proper beans on toast!" So I put a can in the basket and kept it on my dresser when I get home so no one would see it in the pantry and eat it before I could get to it. Finally, a few days later, lunchtime came around and I didn't have anything perishable in the fridge waiting for me to finish, so I got the can of beans out from my room and prepared the kitchen for something remotely resembling cooking. 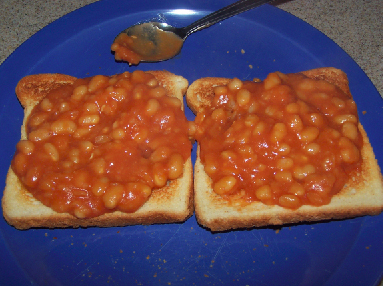 Knowing nothing about beans on toast besides hearing from Mom that she had it for lunch while she was in the UK back in the day, I went online and watched an educational video on how to make beans and toast, and also read several webpages on the subject. I correctly guessed that the "recipe" was essentially as simple as making toast, heating up some beans, and putting the beans on the toast, but I wanted to make sure I was doing it right so I didn't eff it up by skipping some essential yet not obvious ingredient or step and getting chewed out by beans and toast fans for messing up their favorite food. According to the educational video, I had to heat the beans on a stove top in order for this to be legit, so I washed out the pot Dad cooked his Cream of Wheat in that morning and started heating the beans. I tried to have the toast come out the same time the beans were nice and hot, but that didn't work out too well. During the time when the beans were still cool on the stove and the toast was not yet fully toasted, I got out a couple of pats of butter ready to spread on the toast, because that's what the educational video said I had to do. At this point I admit i was kind of skeptical about how these beans would come out. Compared to US canned beans, these looked kind of sorry and lacking in definition. American beans are darker and sweeter, these are tangy and a bit bitter, and paler looking. Sort of like school cafeteria beans. Also, Heinz Beans are stored in tomato sauce. 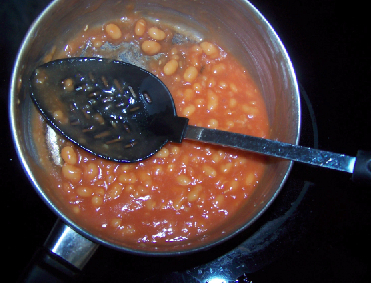 Why aren't Heinz Beans stored in bean sauce? At least its not as silly as when canned peaches and oranges are stored in pear juice. I started by heating up a half can of beans, because according to the internet a half can is good for two slices of toast and I wanted to try a couple to make sure I like them before I invested an entire can and four slices of toast. Also, I could barely fit two slices of toast as it is. When both the beans and toast were ready, I spread the butter and plopped the beans on top. Its true, a half can is prefect for two slices of toast. The educational video said shredded cheese was optional, but the shredded mozzarella I used on my "toast pizzas" didn't seem appropriate, so I left my beans and toast un-garnished. I ended up liking this a lot better than I expected to. In fact I may even keep a couple of cans of Heinz Beans around for the occasional Saturday afternoon snack. I made two more slices of toast right away to finish off the bottom half of the can. I had a close call where one of the second two slices of got snagged inside the toaster as they popped out, so I had to unclog the toast with a fork (after unplugging the toaster of course) and luckily the toast was not ruined or burnt. Anyone looking to attempt beans on toast for themselves, my warning to you is this: once you pick the toast up off the plate, don't put it back down, just hold it with your fingertips till you finish the entire slice. Putting the toast back on the plate will allow condensation to from on the underside of the toast, compromising its hot crispyness. Does anyone live outside the US and their local food store has an "American food" section? I bet its filled with Oreos and ingredients for making potato chip sandwiches.